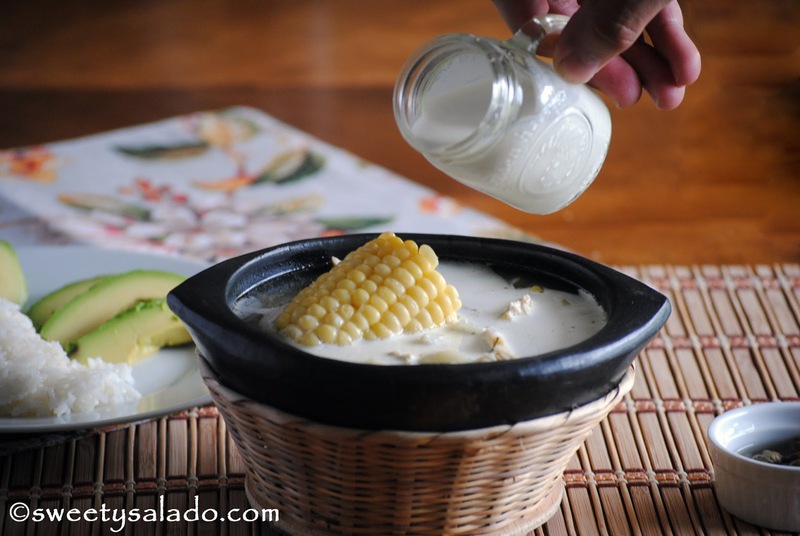 This week I decided to post another typical Colombian recipe, the ajiaco santafereño or bogotano. For those of you who are not very familiar with Colombia, the name santafereño comes from the official name of the capital of Colombia which is Santa Fé de Bogotá, that’s the reason why some call it ajiaco santafereño, others call it ajiaco bogotano and others simply call it ajiaco. Because this recipe is made mainly by the people who live in the capital, I never had it while living in Colombia because I was born and practically raised in Medellín. It wasn’t until years ago that I was curious about it and because there aren’t any good Colombian restaurants close to where I live, I had to find out how to make this recipe, learn it and adapt it to my personal taste. The first time I found this recipe was in an old Colombian cookbook I have but it didn’t help much because not only is it badly written, it also has the amounts in grams and pounds which I’m not very familiar with. So, I kept researching and then I found several recipes online that kind of explained how to make it, one of them by The Washington Post (who knew?!) and I finally ended up combining many of these recipes into one which I’m sharing with you today. 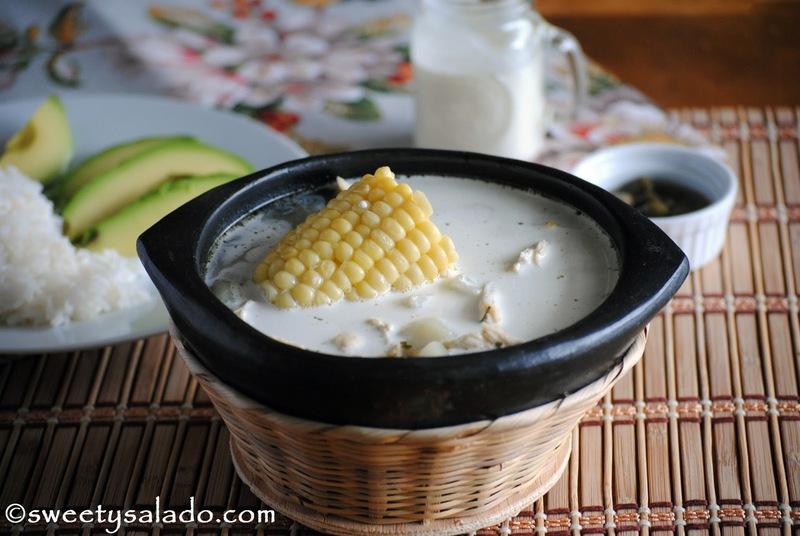 In my opinion, what makes a good ajiaco special are three key ingredients. First, the papa criolla, which is a yellow potato that grows in the Andes mountains, it has a very unique scent and flavor and that is why it is essential for this recipe. It is sold in the US, either bottled or frozen, by many Latin grocery stores or even online. 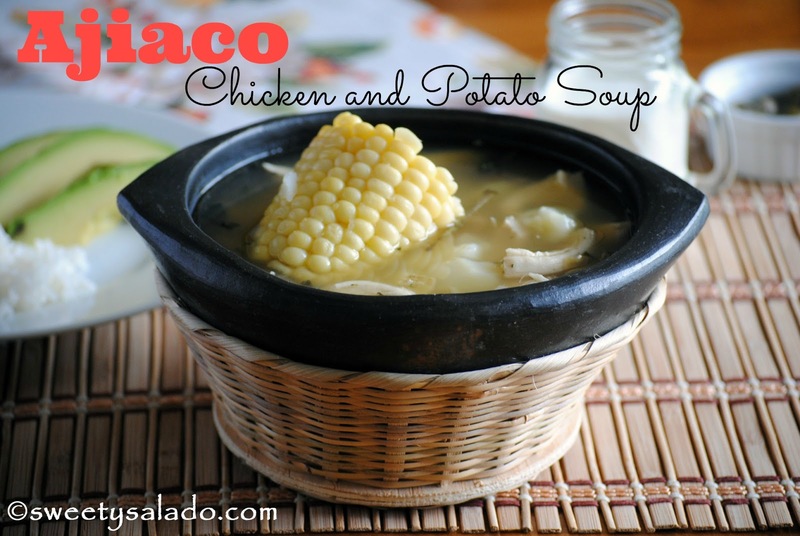 If you can’t find it anywhere you can substitute it with a regular yellow potato; however, I have to say that your ajiaco won’t have the same flavor. The second ingredient are the guascas which are called quickweed or gallant soldier in English and are only found fresh in Colombia since they’re considered a type of weed anywhere else. These guascas, just like the papa criolla, also have a unique scent and flavor and to me they kind of smell like banana leaves, the ones used for Colombian tamales. These are sold dehydrated or dried here in the US at Latin grocery stores or online. In another Colombian food blog I saw that they recommended using oregano as a substitute but in all honesty I doubt that an ajiaco would taste the same. And the last ingredient is corn. Try to find the whitest corn cobs you can find because the yellow ones that are usually found here in the US have a lot of sugar and your ajiaco will end up being too sweet. And the last thing I can recommend is to try not to be intimidated by this recipe because it’s really easy to make as long as you have all of the ingredients ready. Take your time because it can be time consuming and enjoy it with your family on a nice weekend. You’ll see that everybody will ask for seconds and you’ll remember our beautiful country between each bite. 1. Place the white onion, green onion, garlic, cilantro and bay leaf inside the cheesecloth. Gather all corners and make a bundle. Tie it up using the cooking or kitchen twine and cut off the excess. 2. In a large pot or dutch oven add the chicken breasts, the seasoning pouch you made in the previous step, the water, chicken bouillon, salt and pepper. Cover, bring to a boil and cook at medium low for about 35-40 or until the chicken breasts are cooked. Then remove the chicken from the pot, let it cool and shred it into big pieces. 3. Peel and slice the potatoes, the papa criolla can be cut in half. First add the red potatoes and the corn to the pot, cover, bring to a boil and cook for 10 minutes. Then add the russet potatoes, cover again, bring to a boil and cook for 20 minutes. Last, add the papa criolla and half of the amount of guascas. Cover again, bring to a boil, lower the heat to low and cook for about an hour or until the soup thickens. 4. After an hour remove the corn and cut each one into three pieces. Remove the seasoning pouch as well and toss it. If the potatoes have not disintegrated, you can let the soup cook a while longer or mash them with a potato masher. Add the remainder of the guascas. Taste for salt and pepper and add more if needed. 5. Add the corn pieces back in the pot, as well as the shredded chicken. Serve immediately with a side of capers, white rice, avocado and heavy cream. Hola! Pregunta: So no consigo papa criolla, puedes recomendar una alaternativa? Hola. La verdad es que la papa criolla no tiene sustituto, el sabor y textura son únicos y ninguna otra papa se parece. Puedes tratar con papa amarilla pequeña, pero como te digo, la papa criolla es única.